Hi, I am John Sarmiento and a junior Sociology/Biology/Medical Anthropology major. In the past week or so, you may have noticed a group of Creighton students roaming the Mall with bug nets and enthusiastic faces – me being one of them. I am currently enrolled in the Biology/Environmental Science class – Entomology. During lecture, we study the Arthropoda phylum and like-animals. In other words, we learn about bugs. 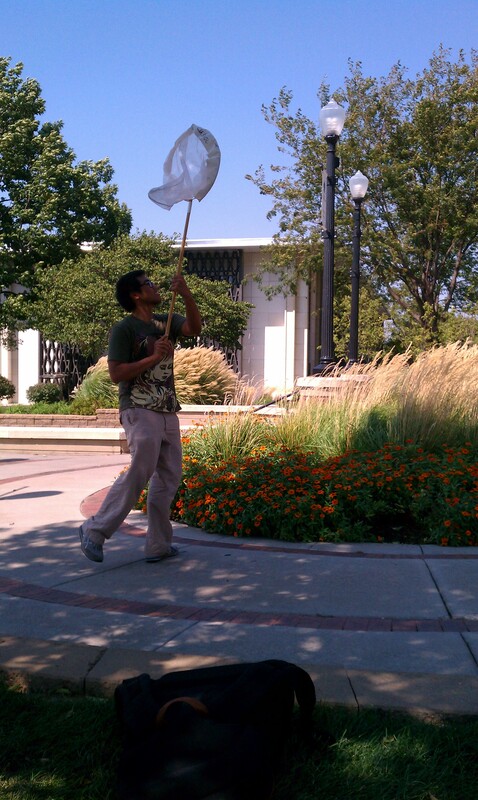 My favorite part of this class is our labs: roaming around campus or insect-filled settings and catch bugs. Two weeks ago, we started our first lab. Our teacher, Professor Ted Burk, showed us how diverse our campus is – not only Creighton’s student body, but the plethora of different kinds of insects that dwell in every nook and cranny of Creighton University, whether underneath rocks, hanging off leaves of trees, or above the colorful flowers that decorate our campus. So on our first day, all of us in the class were equipped with aerial nets (aka butterfly nets) that are designed to catch anything flying or roaming upper layers of vegetation. We were swinging the nets like mad at the variety insects, then placed them into containers so we can observe the beauty and complexity of the insects. It was amazing to discover the beauty of nature: the colors, the patterns, the structure, etc. The subtle differences differentiate species, like a small spot on a wing of a butterfly. It is unbelievable to think that Creighton (and even the world) holds such diversity. Taking this class has helped me appreciate campus even more because it homes not only students, but a variety of fauna that is often overlooked.